More organizations are hiring military veterans every day. In addition to benefiting from the skills, dedication and experience that veterans offer, qualifying employers can earn a tax credit for their commitment to hiring, training and retaining veterans. Many of our clients, particularly government contractors, hire military veterans. Let’s look at some of the tax credits available to employers who hire veterans. If you’re a business owner or CFO, the idea of leaving money on the table is cringe-worthy. Tax credits and incentives offer the opportunity to lower your construction company’s tax burden, dropping more money to your bottom line. If your construction business isn’t taking advantage of every available tax savings opportunity, you’re missing out. Many construction contractors, however, aren’t aware of some Maryland and federal credits that could generate substantial tax savings for them. With the confusing terminology, complicated tax code and the feeling that tax rates are just too high, many business owners hear “taxes” and run the other way. However, there is one tax phrase that’s easy to understand and every business owner likes to hear: safe harbor. With the de minimis safe harbor election, you can immediately expense certain assets up to $2,500. If you have an applicable financial statement (AFS), this goes up to $5,000. Sound good? You must act NOW to ensure that your business is eligible to make this election for the 2018 tax year. Do you find yourself stuck performing (sometimes mundane) tasks in areas of your business that might be better off performed by someone else? Most small business owners would answer with a resounding “YES!” In the ideal world you’d have a chief financial officer who generates financial reports that help you monitor profitability. Wouldn’t it also be nice to have a human resources director to coordinate hiring and employee benefits for your business? Let’s not forget about a chief technology officer who can make sure your computer network and software are up and running smoothly 24/7. If this sounds like a dream come true for your business, join the club of small business owners who would love to delegate accounting, HR and technology tasks to someone else. But what if that “someone else” doesn’t exist in your business? As a small business owner, you know what it’s like to perform a juggling act. From sales and accounting to technology and human resources, you keep dozens of balls up in the air every day. It goes without saying that all this juggling can make it hard to focus on the long term growth of your business. Instead, you spend your time just maintaining the status quo, while sales and profits plateau. More times than not, if the financial reporting task were given to someone who could also provide strategic financial guidance, your business would have an edge and be able to get a step ahead of the competition. 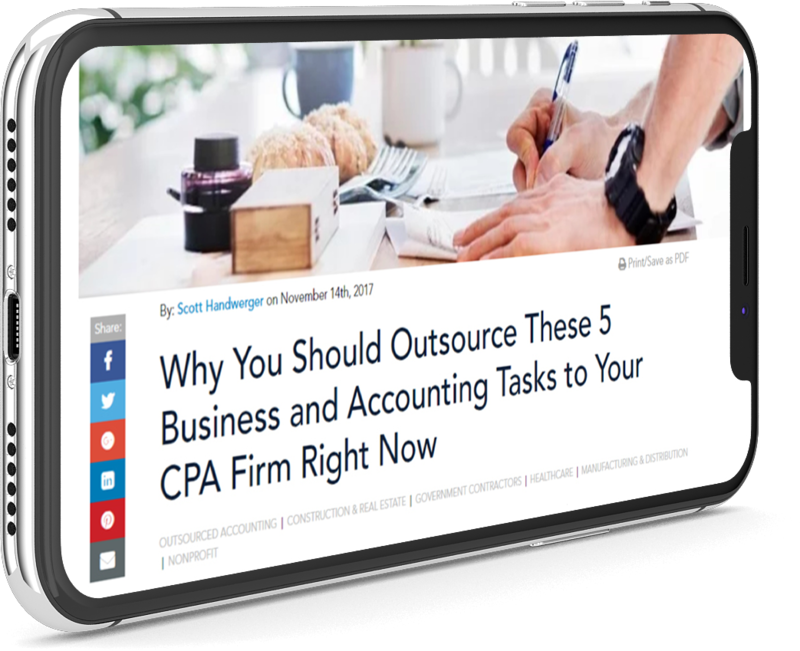 Even as a CPA firm, we’re not above admitting that while the accounting function is incredibly important in any organization, it is often time consuming and gets in the way of more exciting revenue-generating business initiatives. If, as a business owner, you have toiled over internal accounting tasks when you could have spent that time on big picture items like developing an amazing new marketing campaign, you’re not alone. That’s why recent years have seen a growing trend in business owners outsourcing their accounting function to CPA firms. How do you know whether outsourcing the accounting function makes sense for your business? Let’s pose some questions.